Researchers have identified key genes associated with flowering time in the pigeon pea, a finding that could lead to more productive plants for this important source of protein. Pigeon pea yields have remained stagnant during the last 60 years, which has hurt farmers in Asia, Africa, Latin America and the Caribbean who rely on the legume to feed their families and make a living. Pigeon peas are an important source of protein in the diets of more than 1.5 billion people in developing countries. "In agriculture, we want plants that flower at the best time for a particular place. But with climate change, that time is shifting," said Eric von Wettberg, professor of biological sciences at Florida International University and co-author of the study. Von Wettberg, a conservation geneticist, helped analyze the data. He conducts his research with the International Center for Tropical Botany, a collaboration between FIU and the National Tropical Botanical Garden. Flowering times of any plant are influenced by the environment, including soil, sunlight, temperature and pollen conditions. It is a local decision. If a plant flowers too soon, it may produce fewer seeds, but, if it flowers too late, it may not produce any seeds. The researchers' genetic finding could help breeders create varieties of pigeon pea adapted to local conditions that will flower at a particular time, producing more seeds in one yield. 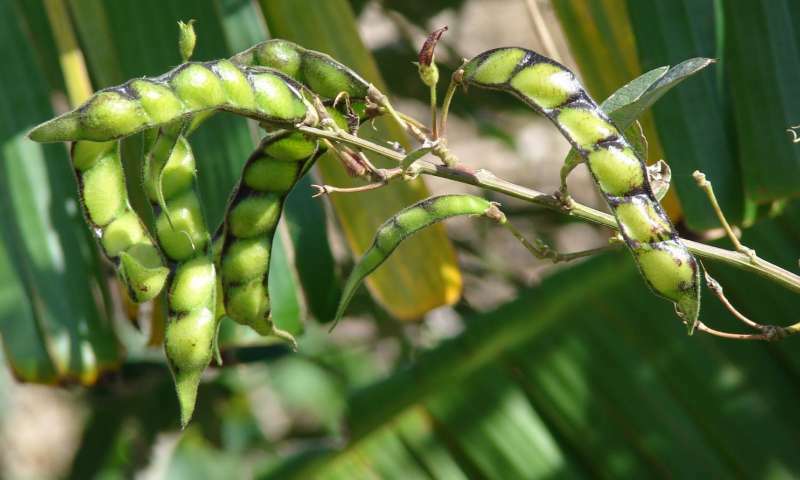 The research team also identified genetic associations responsible for other key traits in pigeon peas, including pod shattering, branching and height. When they become ripe, pigeon pea pods split open and fling seeds away. In nature, dispersal is good because it lets seeds take up residence in new habitats and find refuge from predators and pathogens that target parent plants. But, in agriculture, it is disastrous because that is the food people rely on to survive, according von Wettberg. Identifying the gene responsible for shattering could help breeders create varieties of pigeon pea that keep seeds for longer and are easier to harvest. In different parts of the world, people eat pigeon pea in different ways. The legume is eaten green or ripe, and it is used in a variety of soup, stew, curry and rice dishes. The finding will also allow breeders to create varieties of pigeon pea that keep the culinary and cultural traits that locals prefer. "It's one thing to want to increase the yield of seeds, but the way people eat pigeon pea is a distinctive part of heritage and culture. That's something we don't want to change," von Wettberg said. "If we can keep seeds appealing to the people that use them, they're more likely to adopt them." The researchers will partner with international crop breeding centers to provide them with the information they need to adapt pigeon pea seeds to local conditions. Von Wettberg will extend his research to other legume crops, including fenugreek, grass pea and mung bean. The study was recently published in Nature Genetics. Funded by the U.S. Agency for International Development, it was led by Rajeev Varshney and Rachit Saxena of International Crops Research Institute for the Semi-Arid Tropics, an international non-profit dedicated to reducing poverty, hunger and environmental degradation through better agriculture. Von Wettberg has a long-running commitment to provide support, training and assistance to research staff at the institute.